If your family is planning a visit to Universal Orlando Resort, you’ll need to know where you can get all of your souvenirs from t-shirts to keychains or even a wand! Universal Orlando shopping has lots of merchandise locations throughout both theme parks, CityWalk, and even the on-site hotels. Ollivanders Makers of Fine Wands since 382 BC: You can purchase your very own Ollivanders wand, Harry Potter wand replica, collectible wand set, and more. 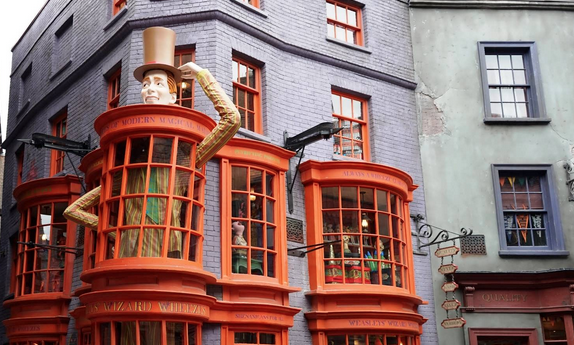 Weasleys’ Wizard Wheezes: This shop is full of novelty items, magical jokes, and toys. Borgin and Burkes: This Knockturn Alley shop sells sinister items like skulls, Death Eater masks, and more. Madam Malkin’s Robes for All Occasions: You can pick up all of your wizardwear here from Hogwarts uniforms to wizard robes. Magical Menagerie: You will find furry, feathered, scaly, and other creatures here like Cornish Pixies, owls, Hippogriffs, unicorns, Crookshanks, Buckbeak, Fang, Fluffy, and Scabbers. Wiseacre’s Wizarding Equipment: This shop is full of wizarding wares and supplies such as telescopes and magnifying glasses. Quality Quidditch Supplies: Equipment and clothing from the wizarding world’s most popular sport is all here, from sweaters to brooms. Shutterbutton’s Photography Studio: You can purchase a moving portrait of yourself here to commemorate your visit to the Wizarding World of Harry Potter. Wands by Gregorovitch: This legendary wandmaker’s shop offers a large assortment of Harry Potter wand replicas. Scribbulus: Witches and wizards writing supplies can be found here including parchment paper, feather quills, journals, and postcards. Cyber Image: This “out of this world” store features Terminator apparel and souvenirs as well as science fiction toys, books, posters, collectibles, and more. Silver Screen Collectibles: You can purchase celebrity pictures and posters, collectible figurines, entertainment and movie books, I Love Lucy, and Betty Boop souvenirs. Brown Derby Hat Shop: You can pick up all kinds of headwear from visors to wigs, hats, and more. Universal Studios Store: This is the official store for Universal Studios souvenirs- apparel, toys, backpacks, gifts, hats, and more! Supply Vault: You can prepare for battle with TRANSFORMERS merchandise including apparel, N.E.S.T. cadet hats, action figures, and Bumblebee car decals. Super Silly Stuff: The minions have taken over this shop where you can get plush minions, unicorns, t-shirts, stationary, loungewear, and more silly stuff! It’s A Wrap: This is your last stop as you exit the park so it is perfect for hats, toys, apparel, and other last minute souvenirs. This store is also the park’s package pick-up location. Shrek’s Ye Olde Souvenir Shoppe: This is your one stop shop for Shrek themed apparel, toys, books, DVD’s, hats, and plush characters. Studio Sweets: This sweet shop is full of candies, fudge, caramel apples, cotton candy, and gourmet cookies. On Location: Don’t worry if you forgot your camera supplies! This store has film and camera supplies, picture frames, backpacks, hats, sun care items, and sunglasses. This is also the park’s photo pick-up location. Aftermath: You can find merchandise that was found after TWISTER… Ride It Out. The storm has brought lots of Twister and cow themed apparel, toys, collectibles, and more. Sahara Traders: This store is full of Egyptian treasure including Mummy themed apparel, toys, Egyptian statues, jewelry, hats, and more. SpongeBob StorePants: You can explore Bikini Bottom and pick up nautical nonsense themed items featuring your favorite characters from the show! The Barney Store: You can pick up the Super-Dee-Duper collection here featuring everyone’s favorite purple dinosaur. They have Barney themed toys, plush characters, and apparel. E.T.’s Toy Closet and Photo Spot: This store offers E.T. figures, toys, and apparel in addition to opportunities to have your picture taken with E.T. Kwik-E-Mart: Stop in Springfield’s convenience store for The Simpsons souvenirs including toys, t-shirts, books, and more. MIB Gear: You can pick up all of your Men in Black devices and gadgets, apparel, toys, and souvenirs with items from across the galaxy. Dervish and Banges: This shop features all kinds of magical merchandise such as Sneakoscopes, Spectrespecs, Omnioculars, and The Monster Book of Monsters. There is also Quidditch supplies, Hogwarts school uniforms, journals, stationery items, and more. Filch’s Emporium of Confiscated Goods: You will find a variety of Harry Potter merchandise here including Hogwarts clothing, house crest banners and stationery, authentic movie prop replicas, Quidditch clothing, magical creature toys, and souvenirs. Plus, you can purchase your picture from Harry Potter and the Forbidden Journey here. Ollivanders: Ollivanders has been the maker of fine wands since 382 B.C. This shop offers every wand you can imagine. You can see a wand choose a wizard or purchase an interactive wand, character wand replica, or Ollivanders wand. Honeydukes: This sweet shop features delicious treats for every guest in Hogsmeade like chocolate frogs, cauldron cakes, exploding bonbons, acid pops, Bertie Bott’s every flavour beans, and so much more! Islands of Adventure Trading Company: This one stop shop has the best items from each island around the park. You’ll find Islands of Adventure logo products, character apparel, toys, hats, jewelry, and more. Ocean Trader Market: Exotic items from all over the world can be found here such as sarongs from India, metal sculptures from Thailand, wood carvings from Indonesia, scarves, dresses, and more. DeFoto’s Expedition Photography: This store has all of your film and camera needs and also happens to be the park’s photo pick up location. Port of Entry Christmas Shoppe: It’s always Christmas in this jolly shop featuring holiday ornaments, decorations, souvenirs, gifts, and DVDs. Island Market and Export Candy Shoppe: Satisfy your sweet tooth with homemade fudge, candy, caramel apples, cookies, chocolate, and more. There are also Universal apparel and souvenirs available. Port Provisions: This is a last minute stop before you exit the park to pick up any souvenirs or gifts you may have forgotten. Gasoline Alley: This service station has everything you need to have fun in the sun. Pick up beach bags, sandals, beach towels, hats, sunglasses, t-shirts, and more. Betty Boop Store: This store offers everything a Betty Boop fan will need such as Betty Boop inspired collectibles, apparel, jewelry, toys, and more. Toon Extra: You can find your favorite cartoon character toys, DVDs, apparel, and more here. Then, stop by the Character Factory to create and dress your own plush animal. Dinostore: This dinosaur themed store has everything that your future paleontologist might need from books to toys, fossil replicas, apparel, and more. Jurassic Outfitters: You can pick up your official Jurassic Park souvenirs here such as hats, toys, apparel, and even beach towels (perfect after riding the Jurassic Park River Adventure). Treasures of Poseidon: There is a variety of treasures from the deep here including jewelry, apparel, and bags. The Coin Mint: You can create your own custom medallion by combining two metal coins for a one of a kind souvenir. The Pearl Factory: You can pick and open an oyster to find your very own pearl. Then, choose the perfect setting for your new jewelry. Historic Families Heraldry: You can search for your family’s coat of arms and then purchase a wall hanging or keepsake. There are also plenty of collectibles available like historic swords and daggers. Star Souls Psychic Reading: You can see what the future holds for you here with psychic reading or decorate your body with Henna art. Spider-Man Shop: This store has everything inspired by your favorite web slinger from Spider Man collectibles to action figures, toys, mugs, key chains, and more. Marvel Alterniverse Store: You can look like your favorite Marvel universe superhero with the apparel, toys, mugs, and souvenirs here. You can even get your picture taken with the Amazing Spider Man! Comic Book Shop: Purchase Marvel comics, graphic novels, books, posters, and collectible figurines. Oakley: Find your own pair of stylish shades with the full collection of men’s and women’s sunglasses, watches, sandals, backpacks, and sport goggles. Kingpin’s Arcade: You can try your luck at arcade and video games like driving simulators and shoot ‘em ups. Cats, Hats, & Things: You can find apparel, toys, and gifts inspired by the Cat in Hat. All The Books You Can Read- This store features the whole collection of Dr. Seuss books in addition to apparel, toys, and DVDs. Snookers & Snookers Sweet Candy Cookers: This sweet shop has cooked up an array of candies, homemade fudge, cotton candy, snacks, and caramel apples. Mulberry Street Store: You can find merchandise featuring all of your favorite Dr. Seuss characters here from the Grinch to the Cat in the Hat. There is apparel to fit every member of the family, character cups, novelty hats, wigs, toys, and more. Element: This store features all of the skateboarding apparel and equipment you need. Fossil: Whether you are looking for a new watch, wallet, sunglasses, or belt, for you or as a gift, you’ll be sure to find just what you’re looking for here. Fresh Produce: This women’s apparel boutique has stylish and comfortable clothing made primarily in the U.S. The Island Clothing Company: You’ll find everything you need for an island getaway here with brands like Tommy Bahamas, Quicksilver, Lacoste, and more. P!Q: This fun and innovative shop offers unique gifts, toys, household items, and personal accessories. Quiet Flight Surf Shop: This location has everything you need to enjoy the outdoors in style with top brands including Billabong, Oakley, Reef, Quicksilver, Hurley, Rip Curl, Element, Roxy, and so many more! Universal Studios Store: You can stock up on theme park merchandise without ever having to buy admission. This shop has logo apparel, souvenirs, character items, and so much more. Hart & Huntington Tattoo Company: The world’s most famous tattoo company has apparel, art, and even permanent souvenirs you can purchase. Bob Marley A Tribute to Freedom: This shop will make you feel like you’ve ended up in Jamaica with their collection of shirts, hats, CDs, posters, beach towels, jewelry, and drinkware. The Bubba Gump Shrimp Co. Restaurant and Market: Don’t forget your Forrest Gump DVDs, Bubba Gump apparel, Mama Gump seasonings, and more at this shop. Jimmy Buffett’s Margaritaville: Every Parrothead will love the Margaritaville merchandise, items to make your own margaritas, and souvenirs. NBA City: You’ll find official NBA jerseys, hats, and shirts from your favorite team here. Pat O’Brien’s: Pick up t-shirts, sweatshirts, hats, drink mixes, glasses, and more at this reproduction of New Orleans favorite watering hole. Hard Rock Cafe Shop: Rock out with collectibles, apparel and more from your favorite rock stars. Hard Rock Rock Shop at Hard Rock Hotel: Find authentic memorabilia and collectibles here in addition to apparel and souvenirs. Le Memories de Portofino at Loews Portofino Bay Hotel: This boutique features the latest fashions as well as unique gifts for your friends and family. Treasures of Bali at Loews Royal Pacific Resort: Pick up island crafts here with your souvenirs. Universal Gift Shop at Universal’s Cabana Bay Beach Resort: This shop features gifts you might have found back in the 50’s in addition to Universal Orlando Resort merchandise.